We’re always busy looking for ways to make the most of exciting yarns, which is why we were thrilled Jane Burns came up with a great idea for this lovely yarn. 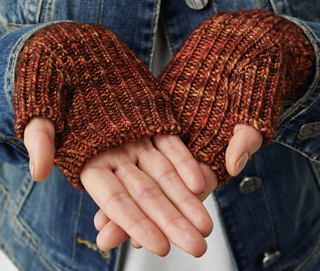 Her mitts are made by knitting a twisted rib, tweaked with a cable pattern to add that exquisite detail. With a little motivation we think you could knit them in a week. Note These mittens are worked in a twisted rib throughout, and all knit sts are worked into the back loop unless otherwise stated. The fabric produced is very stretchy. Block your mittens to open up the stitch pattern to its full potential.